The UK Government’s Technology Strategy Board announced yesterday that a consortium led by BMW Group will be supported by a proportion of a £25m fund, enabling the MINI E to be introduced and tested on British roads by a mixture of private, corporate and public sector drivers before the end of 2009. The Technology Strategy Board exists to promote business innovation in technology and BMW Group’s application followed an invitation for proposals outlining innovative, industry-led collaborative research projects involving ultra-low carbon vehicles. The objective of the Technology Strategy Board is to encourage manufacturers to develop ultra-low carbon vehicles that customers want to buy and bring them to market as rapidly as possible. MINI E models will be on UK roads for a twelve-month field trial that will evaluate the technical and social aspects of living with an all-electric vehicle in a real world environment. This year-long project will play an important part in informing future strategic and technological decisions. BMW Group is bringing together an energy infrastructure provider and an academic partner, with the support of a regional development agency and local authorities, to make the MINI E research project a reality in the UK. 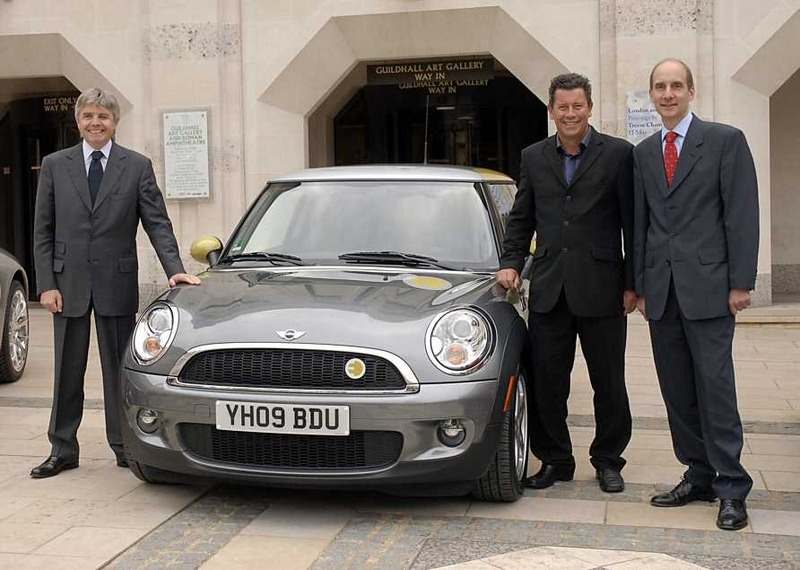 The MINI E UK Research Consortium, of which BMW Group is the lead partner, comprises several organisations which are based around Oxford and the South-East of England. All will play important roles in the collaborative field trial. The consortium’s other members include an electric energy and infrastructure provider (Scottish and Southern Energy), an academic partner (Oxford Brookes University’s Sustainable Vehicle Engineering Centre) and the South East England Development Agency (SEEDA) as well as Oxford City Council and Oxfordshire County Council. Scottish and Southern Energy, the UK’s leading generator of energy from renewable sources, will be responsible for providing the infrastructure in and around Oxford and other locations in the South-East of England by installing the private and public charging points that will be required to recharge the batteries in the MINI E test vehicles. Oxford Brookes University, under the direction of Professor Allan Hutchinson who leads its Sustainable Vehicle Engineering Centre, will be responsible for undertaking scientific data analysis as well as conducting customer surveys to capture the subjective feedback from users of the MINI E test vehicles. A comprehensive report documenting the main findings of the MINI E research project will be published at the end of the trial. This will help inform those bodies seeking to create the political, technical and commercial framework necessary to enable sustainable mobility in a low carbon future to become reality. The announcement of the MINI E UK Research Consortium’s field trial means that the MINI E will now be tested in all three of the MINI’s largest markets as similar 12-month research projects are already underway in Germany and North America. BMW is also doing the same program in the NY City metro and the Los Angeles metro areas here in the US with the MINI E being leased to local governments for $1/year. Some towns plan to use them for water meter readers, parking enforcement and various building/fire code enforcement officers or for near area use due to the 60-100 mile limits and seating for only 2 people. They could have given the £25m to LDV to develop their electric vans and become independent again. Instead we invest in BMW! And what is wrong in investing in BMW – or rather investing in the infrastructure that will allow Electric Minis to work properly in the UK? We seem to forget how much BMW has pumped into the British Automotive industry, investing not only in Cowley but also Hams Hall Engine plant that builds all BMW’s 4 cylinder petrol engines. That’s before you take account of the billions of BMW’s money thrown down the drain by inept British managers when BMW owned Rover or the massive BMW subsidy left to MGR/Phoenix which was blown on the Senior Managers’ Pension Fund! Nothing wrong with investing in BMW as a second choice. My first choice would be to rescue LDV, invest in electric vans and sell them to local authorities etc. BMW have been good recently in the UK and my post did not criticise them. You state “BMW’s money (was) thrown down the drain by inept British managers when BMW owned Rover”. Care to enlighten us? The other side of the coin was that Rover under BMW developed product on a shoe string and was treated as the poor relation. I agree about the amateurs who took over after BMW. It’s as big as a Land Crab so they should have called it a Maxi – darned cheek calling it a Mini! LDV already have a near complete design ready to go into production van. However, let’s throw millions at a company who: a. Have done no testing of anything electric and b. Certainly don’t need the money!!! Let’s face it, vans do considerably more miles as they are a working tool. A MINI is for trips to the shops, Sunday outings and visiting the Mother-in-law. It makes sense to give the money to LDV – not BMW.